While white vinegar, a common kitchen staple, has its fair share of benefits, it doesn’t compare to apple cider vinegar. Treating health concerns that range from minor issues like hiccups to relieving cold symptoms, diabetes, heart problems and more, there are a lot of important reasons to keep apple cider vinegar in your pantry. Apple cider vinegar has been used for health-related purposes for centuries. It was commonly used to help heal wounds, for cleaning and sanitizing and to preserve food. Even Hippocrates, recognized as the father of medicine, recommended a concoction of honey mixed with apple cider vinegar to sick patients to help treat coughs. 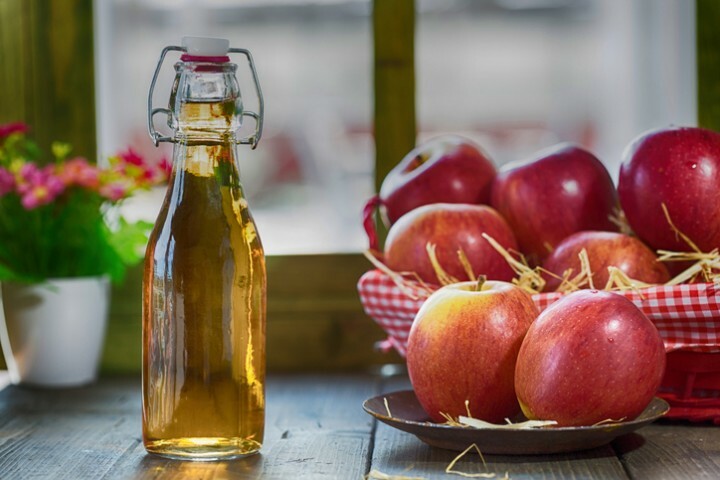 There are several ingredients that vinegar can consist of, including apples, honey, molasses and grains. First the apples are put through a crushing process. Bacteria and yeast are then added to the liquid to start the alcohol fermentation process. The sugars are transformed into alcohol as well. During the second fermentation process, the alcohol is turned into vinegar by acetic acid-forming bacteria, also referred to as “acetobacter”. Acetic acid is the key ingredient in vinegar that causes its bold, sour flavor. Unfiltered, organic, apple cider vinegar is nutrient rich, containing a substance referred to as the “mother,” which includes strands of proteins, friendly bacteria and enzymes that give it a cobweb like, cloudy appearance. Many believe that it’s the “mother” that delivers most of the health benefits. Apples have long been known for their health benefits which include, but are not limited to reducing the risk of asthma, cancer and cardiovascular disease. Research has also indicated that consuming apples improves the intestinal environment. In addition, apples contain several phytochemicals that work as antioxidants. These phytochemicals have also been found to be successful at lowering cholesterol and suppressing cancer cell proliferation. Apple cider vinegar contains healthy ingredients that include vitamins, including vitamins B and C, minerals, amino acids, acetic acid, citric acid, magnesium and polyphenolic compounds, all key elements for optimal health. Following are additional health benefits of this powerful vinegar option. The high concentration of beneficial ingredients in apple cider vinegar helps prevent disease by combating oxidative stress. This type of stress is caused by free radical toxins found in food, water and the environment that burdens the body. In a healthy body, free radical production is counteracted by antioxidant activity. If this balance is negatively affected, you’ll experience more free radicals than healthy antioxidant activity, with the result being oxidative stress. This imbalance will ultimately result in disease. It appears that apple cider vinegar may have the potential to help the body maintain a healthy balance by adding antioxidant rich vitamins and enzymes, encouraging good health. Having a healthy liver and kidneys is crucial when it comes to sustaining optimum health and a quality life. Apple cider vinegar can help protect the kidneys and liver by supporting the body’s detoxification pathways and battle the constant bombardment of chemicals we all face environmentally. When Candida is out of balance, it can trigger a yeast infection or overgrowth in the stomach. When the balance of good and bad bacteria in the stomach and intestines is disrupted by poor food choices and/or antibiotic medications, Candida can accumulate in the GI tract and grow uncontrollably. When this happens, Candida can result in numerous symptoms, including fatigue, irritability, sugar cravings, digestive issues and poor memory. It’s important to note that apple cider vinegar is the only kind of vinegar recommended to fight Candida because of its probiotic and other gut health enhancing elements. There are several ways to take advantage of apple cider vinegar’s anti-microbial benefits. When diluted with warm water, apple cider vinegar can help relieve a scratchy sore throat when used as a gargling solution. The acetic acid in the vinegar also fights bacteria and germs that make us feel sick. Apple cider vinegar can also be used to stimulate your metabolism and combined with a healthy lower-carbohydrate diet and basic exercising, like walking or calisthenics, can quickly melt away unsightly belly and hip fat. The famous Health Crusader Paul C. Bragg, of Bragg’s Vinegar Fame recommends 2 tsps of Apple Cider Vinegar and 2 tsps of Organic Honey in 8 oz. of distilled or purified water 3 times a day. Apple cider vinegar can also be used to help stimulate healthy, vibrant skin by helping restore its natural acidity. Devoted apple cider vinegar users have said that it makes skin tones look more even and that they experience fewer acne breakouts. It can also help reduce age spots and other signs of aging and remove toxins from your face. Here’s a quick and easy recipe depending on skin type. Combine 1 part apple cider vinegar and 4 parts water for sensitive skin; 1 part apple cider vinegar and 2 parts water for normal skin; 1 part apple cider vinegar and 1 part water for oily skin. Apple cider vinegar, thanks to its included acetic acid, has been used as a wound disinfectant and local antiseptic for thousands of years. Numerous studies comparing acetic acid to common household antiseptics have verified that vinegar can successfully kill an impressive variety of bacteria. Apple cider vinegar is frequently used to treat dandruff because of its anti-fungal properties. It also helps fight common causes of dandruff that include oil buildup and Malassezia, an irritating yeast-like fungus. Spraying your pooch with an apple cider vinegar mixture (fill a spray bottle with half water and half apple cider vinegar) after giving them a bath will keep the fleas at bay. You can also make a bit more powerful flea spray by adding 2 or 3 drops of peppermint essential oil. Saturate your pet’s coat with the spray and repeat once a day for a week. Research has shown that vinegar combined with lemon juice can reduce the number of salmonella bacteria frequently found on fresh vegetables and fruit. Even if you usually buy organic produce, there’s still a chance that pesticides so give it a good wash with apple cider vinegar before eating it. You can use apple cider vinegar to remove mold and mildew from shower curtains, to unclog a drain or to remove stains and odors from clothes. Mix 1 part water with 1 part vinegar in a spray bottle and you’ll have a high effective, all natural all-purpose cleaner. You can also use it in the dishwasher as a dish detergent substitute in a pinch, use it to clean windows, kitchen surfaces, microwave, glasses, etc. Medical professionals consider apple cider vinegar safe if it’s not excessively used. Consuming more than 8 ounces a day has been linked to low potassium levels which can cause muscle cramps and weakness. In extreme cases, low potassium levels can cause dehydration, low blood pressure, irregular heart rhythm, diarrhea, nausea, frequent urination and paralysis. Diabetics should avoid consuming apple cider vinegar because it can lower blood glucose levels. Apple cider vinegar should never be consumed straight because it’s highly acidic, which can cause tooth decay and damage the esophagus. It is highly recommended that those with any chronic health condition, consult with their health care provider before using apple cider vinegar as a supplement. Remember the saying “an apple a day keeps the doctor away”? Well, it looks like it pertains here, too, as the benefits of apple cider vinegar are numerous!